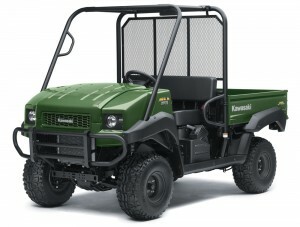 Kawasaki Mule from KIK ATV's from just £50 a week. Lancashire UTV dealer. KIK are pleased to be able to offer you the chance to own a brand new Kawasaki Mule UTV from just £50 a week. These Mules are versatile and economical machines. Fitted with speed variable power steering for ease of use, these UTV’s are designed to be strong as well as comfortable. Selectable 2 and 4 wheel drive as well as locking differentials to give you the traction you need. Terms: £1500 deposit followed by 48 monthly payments. Subject to business purposes only and subject to credit approval. Offer untill 31st of March. VAT is payable on the full cost price.